From Dr. Terry Lynch, Mental Health Academy: “Prescribed drug dependence [is] such a major issue, consistently swept under the carpet by psychiatric drug prescribers. 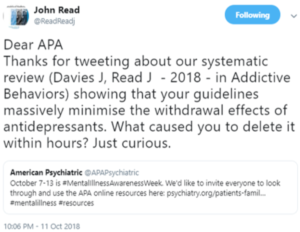 Where are the prescribers of these SSRI antidepressant substances – psychiatrists and GPs – doctors who have reassured the public for decades that there are no significant withdrawal problems associated with these substances? I heard they were ‘just like insulin’ so I avoid them because I don’t have diabetes… Dr Read’s tweet was brilliant. Terry Lynch also mentions in his writings that in between “Episodes”, people with “SMI” Diagnoses are rarely “well”. The only people that I know, that get “well” are the people that switch to “non drug ” alternatives. There’s also the neuroleptic dependency issue, sometimes referred to as Dopamine Supersensitivity Syndrome. Abrupt neuroleptic withdrawal can drive a person into crisis. But even a careful drug taper can be very difficult, (because of the neuroleptic effects on the brain during consumption). I found that it can take years to successfully withdraw from neuroleptics. In my opinion neuroleptic drug withdrawal syndrome is more “malignant” than “mental illness”. But it is possible to withdraw from neuroleptics and recover completely as a result.